Equinox is getting into the spirit of Gay Pride month with their recently announced #POWEREDBYPRIDE campaign, which is using social media to support the LGBTQA world. The fashion-friendly fitness brand has partnered with L.A.-based artist David Flores to create interactive street murals in New York, London and San Francisco. The campaign highlights those who are powered by pride and encourages social media types (essentially everyone reading this very story) to take photos in front of the murals to reinforce the message of Pride and share personal quotes and thoughts on how Pride powers their lives. Laverne Cox was one of the first big names who got on board this week, writing on Instagram: “Pride for me is about living authentically, having the courage and power to stand tall spiritually, emotionally and physically in my truth. 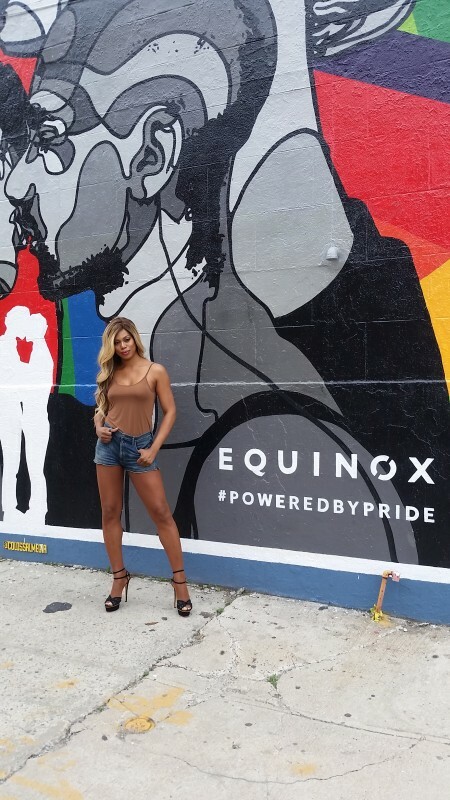 Join me by sharing what pride means to you, and visiting the@Equinox mural in Williamsburg to share a kiss in support of universal love!’ #POWEREDBYPRIDE / @HETRICKMARTIN / #eqxambassador” Need another enticing reason to do it? For every use of the #POWEREDBYPRIDE hashtag, Equinox will donate $1 to the Hetrick-Martin Institute and The Pillon Trust. If you can’t make it to the murals (Click HERE for the Brooklyn location), many on the ‘Gram have already lent their support to the campaign using the hashtag wherever they are, so get on it. We’re talking to you, Ruth Bader Ginsburg.